Can anyone tell me what this detail is for in the pattern? Number 7 there. Is it a belt or ??? I left it off, didn't even cut it out actually, because I didn't know what it was for - it looks to just be a string of bias trim sewn on the waistband. 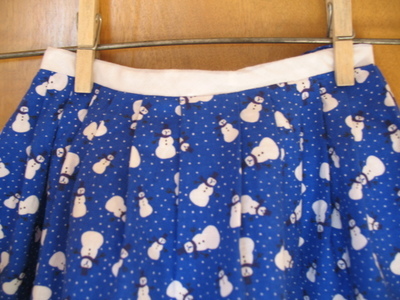 Snowmen and eyelet. 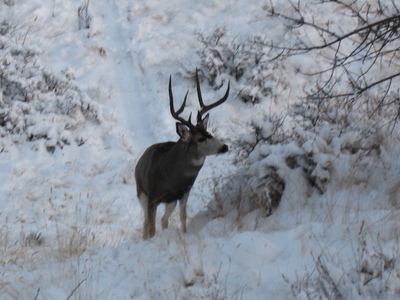 Hopefully this will look good as long as there is snow on the ground. The underskirt really helps it puff and twirl, so it has become a favorite already. Where do little girls get that need to twirl? I also made a skirt for my two-year-old. Pictures of that to come, too. 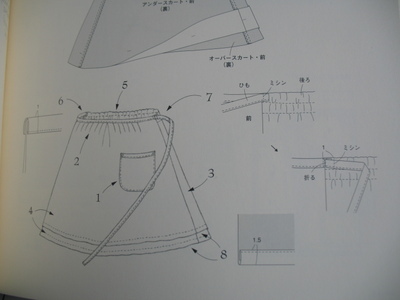 It is a pattern from Girly Style Wardrobe, a Japanese sewing book. The skirt had to get worn right away, which naturally follows that it had to get dirty, and had to get washed. It's in the dryer at the moment. For now, go and try this snowflake. 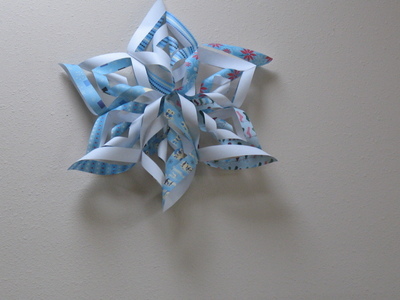 I learned how to make these years ago from an issue of Family Fun magazine. The best part about these is that you can make them any size you want, and any color. I'm going to get the kids busy and see if we can do some really big ones using some of my 12" scrapbook paper. After they finish playing "boat tent" that is. Boat tent is one of those games they never tire of. They made it up themselves - part don't-touch-the-floor, part fort-out-of-couch-cushions, part blanket-tent-camping, part Noah's ark. The main structures are held up by the coffee table and the card table, with lots of clothespins and sheets, etc. It takes over the entire room, but is easy to clean up, and occupies them for hours. Without television. Amazing. *Edited to add photos of the results. Not all women wear headbands, but I do. I wore them when they were cool, uncool, and still wear them. Now that they are hip again I don't look as geeky. The other day I bought some lovely ribbon. I was planning to do a nice little photo tutorial on what I consider to be the easiest headband ever, but like many ideas, someone on the web has already done it. 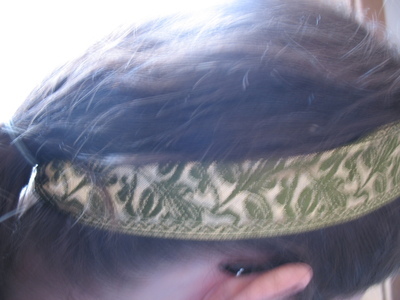 So here is a link to my favorite headband, and tomorrow I will post some pictures of a few I have made. 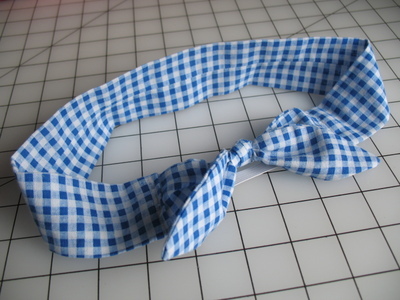 I will just add that A) I only use one hair elastic (otherwise know as a hair binder or a ponytail holder) and B) fabric glue works just as well as sewing, sometimes even better because it can help to make your seam stiffer so the ribbon doesn't bunch at the elastic. But you do need a strong glue - I don't think hot glue would cut it. And while I'm thinking of it, I hope you've all seen the daily themed roundup of tutorials over at Sew, Mama,Sew! What a grand idea. 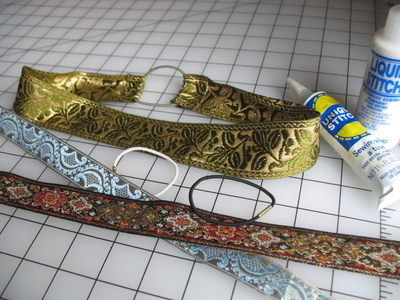 Ribbon, hair binders and fabric glue would make a great craft-kit-gift for someone this Christmas. You can use the elastic to hold a ponytail. This headband is from a free pattern over on HELLOmynameisHeather. 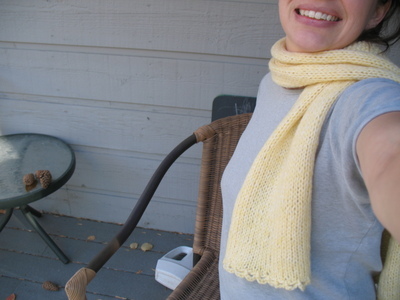 I knit a sweater many, many months ago for my then-baby first daughter. 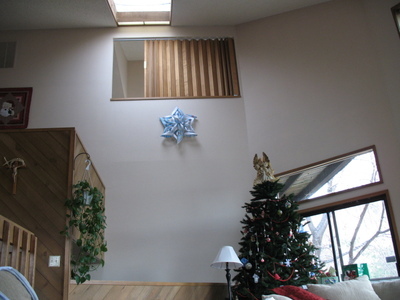 I used a modular approach from a pattern given on an episode of Carol Duvall. It looked ok once it was finally finished, but my baby only wore it once, maybe twice. The sleeves were hopelessly too long and the entire piece too bulky to be comfortable. I had bound off two pieces only to find later that they were too narrow, so I just fixed them using crochet, not having any idea how to cast back on to a finished piece. I never wanted to knit again. But things do change. While watching another episode of Carol Duvall, I saw Suss Cousins demonstrating a project. I don't remember what she was making, but I do remember that her movements were much more fluid than mine had been, and her knitting just flowed. It was like crochet, but with two needles instead of a hook. I had found continental knitting and I happily filed the knowledge in the recesses of my mind. I sent it to my sister for her birthday. Here Today, Here Tomor... Er - When? Posts in the immediate future will likely be fewer and further (farther?) between due to an unfortunate incident involving my laptop, a teenager, and a glass of water.